Gareth Laffely is a musical prodigy, a multi-instrumentalist who's been playing since he was four. 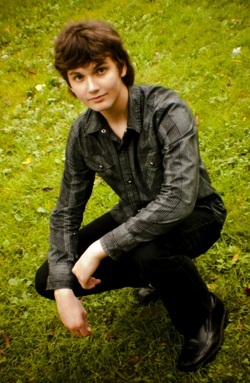 Although he's just thirteen, he's already written dozens of song and performed with professional musicians. He has a recently released CD to his credit. Not only is Gareth a musician beyond his young years - he also already has developed compassion for others. That kind heart recently led him to present the Indian Island School with a native flute. He is hoping that leads to more of the instruments coming to the school in the near future and a resurgence of interest in the instrument on Indian Island. Gareth lives in Tennessee with his mom Susan Oliver (who is a gifted musician in her own right), but there is a strong tie to our area. Oliver is from Orono, with family still living there; she and Gareth frequently come here still. When they were in Maine this spring, Gareth gave a concert at Indian Island School on the native flute, which he said he hooked him after only playing a couple notes on one while on vacation in New Mexico. He said the response was amazing - but he was somewhat surprised to learn the students had not been exposed to the native flute. "I had also learned there were no local flute makers, that it was kind of a dying instrument," said Gareth. "It made me want to raise awareness of the instrument, to help try to bring it back." Gareth contacted an expert flute maker he knew, and that person made a native flute for Indian Island School, which Gareth recently presented as a gift to school music teacher Melissa Barton. More of the instruments may follow. "We're not sure of the exact number yet. It's something we're trying to still figure out," said Gareth, who also plays piano, violin, drums, and Scottish bagpipes. "Hopefully, we might be able to get a program going at the school on the flute." Reviving the native flute is but one of the causes on which Gareth, whose dad is a musical therapist, is currently working. He also is involved in work with early detection for cancer (he had a very good friend who passed away after being misdiagnosed) and zero tolerance for bullying. Music is the centerpiece for his good work, and he hopes to be able to continue to use it that way for many years. "I definitely hope to pursue a career in music," he said. "My main goal is to spread a positive message. A lot of modern music is dark; I want to encourage people to get involved in a cause. It just takes one raindrop to start a ripple that carries across an entire pond." Gareth's CD, "The Journey," which is described as "one part Traditional Native American Flute -and two parts Jethro Tull," is available online at garethmusic.com. of those things himself at age 13.
life struggle of a family friend. her son can be a good role model for other teens. from people who have heard it”. as a musician worth the effort.